Fettisdagen and Valentine's day; A match made in heaven. Here in London, while many are preparing for Valentine’s day on the 14th, Swedes are getting prepared for Fettisdagen! Falling on the 13th, it could be said that the sweet cream cakes of ‘Fat Tuesday’ are Sweden’s one true love! This sounds like a match made in heaven, so we’ve scouted for the perfect recipes and ideas to tie the two days together. The Semlor bun is the symbol of Fettisdagen, and we’ve found loved-up recipes perfect for treating your valentine this year! 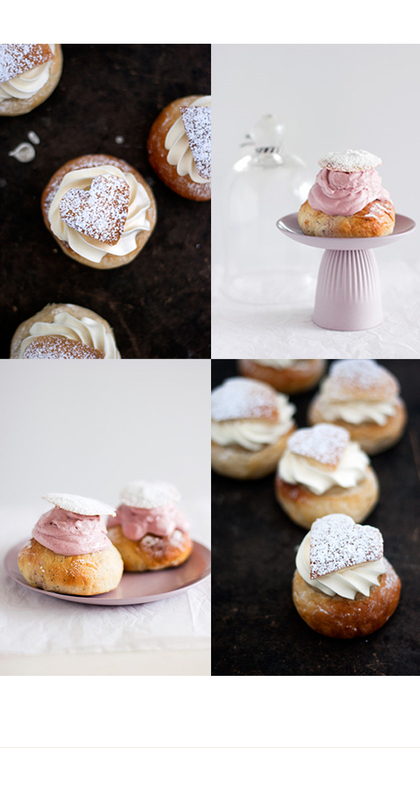 Grona Skafferiet’s post has the perfect recipe to create heart-topped semlor. Swedish Food’s recipe has a break down of everything you need to know about making the sweet buns if you need help translating! Golden rod pastries’ post thinks pink, replacing the white cream with pink raspberry cream. Can’t bake, won’t bake? No problem! We hope you enjoy the sweetness of Fettisdagen with your loved ones for Valentine’s day! Check out our board on Pinterest for more inspiration.